This weekend the TAPS competition team from Paula and Judy’s Dance Connection in Erie, PA and Jamie’s School of the Dance in Kane and Warren PA competed at the Rising Star competition in Niagara Falls, NY. The team did very well, capturing a number of individual and team awards. I asked for and was granted permission to shoot from the balcony. I caught most of the 60+ numbers the TAPS team performed, and came home with nearly 2000 images on my chips. I scrubbed the images down to about 950 shots which I posted on Winkflash for the dance families. If you are one of those families and want to see the images, just get an account on winkflash.com and email me your account, email address and the name of your dancer. I’ll add you as a “friend” and you can wade through the many, many images! 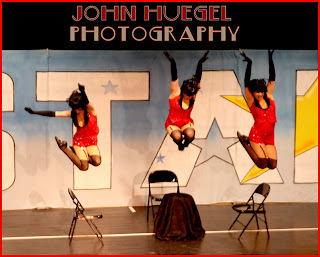 Here is a great jump shot of one of the older ladies’ numbers. I’m fond of leap shots, as they capture the energy, art and athleticism of dance. You will see several more from this series over the next couple of weeks. I was in a very dark auditorium, shooting at ISO1600 f/3.2 at about 1/200 on a monopod with no flash. I used aperture priority and auto white balance, as the color temperature of the many lights they used varied widely, and there were hot and dark spots on the stage. The wider angle shots are a bit soft, but the solo shots taken with my 70-200 telephoto were much crisper.